super pumped to get this card. 100% can make a argument the best ever at their defensive position. I know they each dont sign a lot but how did it take 14 years to get them on the same card autoed ? Awesome PC add for you Ricky, congrats! That's NICE! Congrats on an awesome add! Nice pick up. Bet that was a pretty penny. 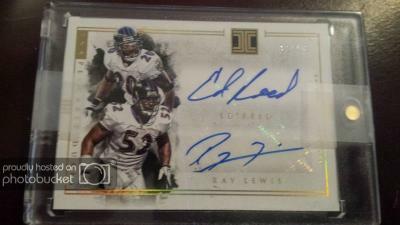 agreed, u would think all those years they played together someone would have thought "hey we should do a dual auto of those 2" very nice pc add ricky!